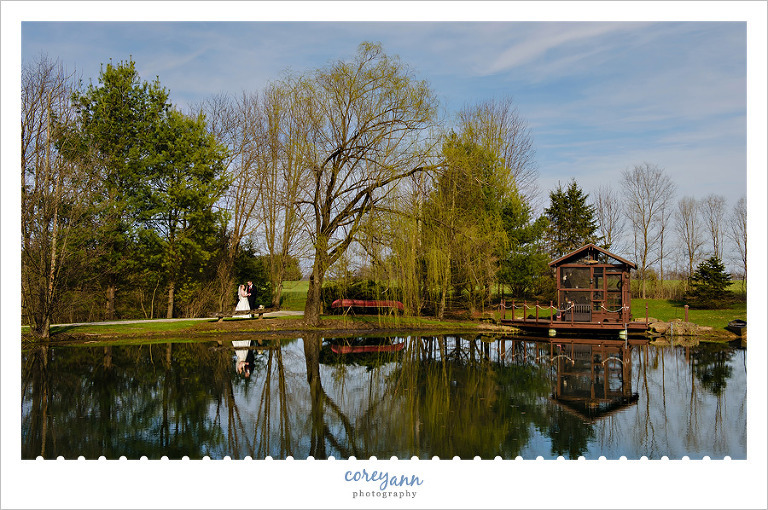 I was super excited to work with Ashley and Daniel back in April at their Country Cottage & Gardens wedding in Mineral City. When we chatted on the phone Ashley and I instantly clicked and that feeling is so fun! One of the best things about their wedding was just how personal it was to them. Although I don’t know them well just with all the details and thought they put into their wedding I felt like I walked away as a friend. They did SUCH a lovely job! They also had Harry Potter music for their ceremony and I may have done an inner jig when the music began to play. I had JUST got back from my first trip to the Wizarding World in Hollywood so it was a very Potter-y April! Since I always have to mention weather because I am a weather nerd (thanks Dad!) I have to tell you I was kind of nervous about their wedding. 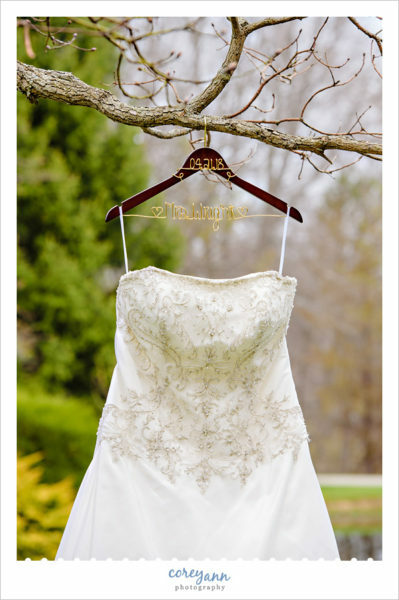 Their venue, Country Cottage & Gardens, is outdoors and she was hoping that it wouldn’t rain. They got SO lucky because in late April it can do anything from rain to snow and anything in between. While it was cool it was really a beautiful sunny day and most people were fine with just a light jacket or sweater. You can’t ask for anything better especially in Ohio! The overwhelming feeling of the day was joy though. Ashley and Daniel were just so happy to be married and start their lives together. Smiles were on EVERYONE’s faces and I don’t know that I have seen a wedding where everyone – friends and family – came together as truly one big happy family. Everyone from their bridal party to their family and friends were so kind and sweet to me and my second photographer (shout out to the amazing Andrew!) that even we felt like we were a part of the family as well. Thank you both so much for trusting me with your special day! I started my day with Ashley’s beautiful dress and I’m so glad she trusted me enough with it to take it on a dress safari outside! 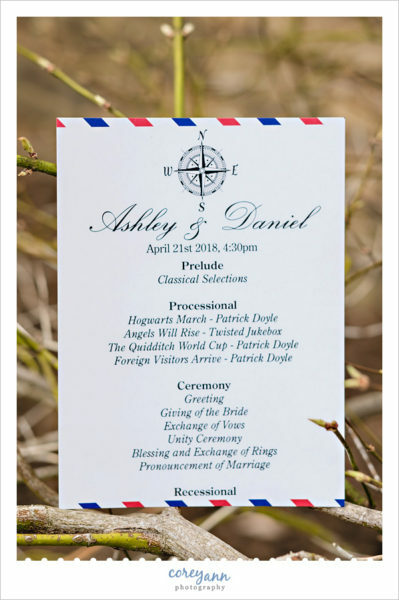 Ashley and Daniel designed their own stationery and it was perfection! While I was with the girls Andrew was over with Daniel and the guys at a nearby cottage. 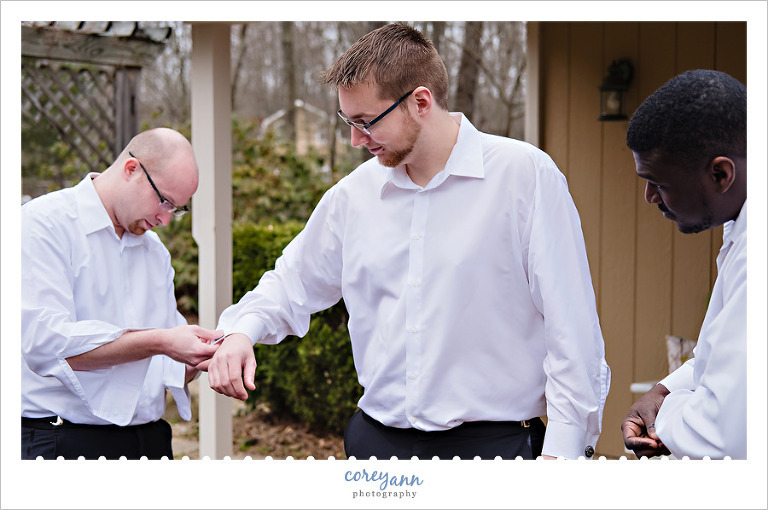 They helped him get ready as putting on your own cufflinks can be a bit tricky! GUYS HAVE IT SO EASY! They were dressed and ready and took some photos while the ladies were finishing up with hair and makeup. I hadn’t been to Country Cottage & Gardens before and I was utterly charmed by it. It’s such a cute little gem! The ceremony area on the pod was perfect! Daniel smiling when he sees Ashley for the first time! Ashley and her Dad made their way up the aisle slowly and perfectly. How beautiful is this ceremony!? Ashley’s parents are divorced but her Stepdad and Dad get along SO well and it was beautifully refreshing to see. This is her Stepdad and Dad shaking hands after her Dad sat down. Now back to the best thing: this couple! I’ve had a few wine ceremonies where the couple mixes wine and shares it however this was my first tea ceremony! Same idea but with tea. It was perfect! While their families made their way to the reception area we did their photos in the ceremony area. I am OBSESSED with their wedding flowers. Ashley made these beautiful paper map roses and their florist mixed them into the bouquets. I looooved this so much! How great of a bridal party is this? The red and black was so striking and perfect. Huge shoutout to those that don’t have matchy-matchy bridesmaid dresses! On our walk over to the reception I couldn’t help but get a few more images on the road as the light was falling perfectly. I may have a love for twirly dresses. I told you I was in love with this bouquet! I couldn’t help taking another photo of it! I loved all the personalized details like the cranes! They had postcards for their guestbook which was smart. The travel theme continued through to the cake. Awww they were so darn cute! Next was time for the toasts – and they were all lovely and funny. After a delicious dinner (mad props to the venue – the food here is AMAZING), they danced their first dance to the Game of Thrones theme song. Their outdoor reception area has a bunch of different levels which made for a unique vantage point for photos and Andrew got a great shot from up there of the dance. Another twirly dress shot, of course! Then Ashley danced with her Dad. And as the Dads swapped places they high fived one another. Then it was time to dance with her Stepdad. And finally Daniel and his Mom for the final parent dance. How fun is this setup? The dance floor was hoppin’ all night long and those that wished to chill and chat were gathered around tables near the heaters or near the firepit. Others were hamming it up in the treehouse photo booth. I hope that I get hired to return here again soon! Ending the post with their lovely rings. I adore the filagree details on Ashley’s rings! SO beautiful!